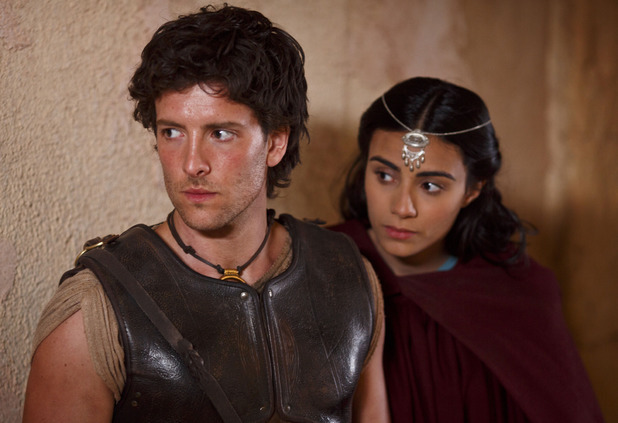 Home / Atlantis / BBC / Mythology / Reviews / TV / [Review] - Atlantis, Series 1 Episode 5, "White Lies"
[Review] - Atlantis, Series 1 Episode 5, "White Lies"
The big news this week in the world of Atlantis is the confirmation of a second series by the BBC. The decision was backed by strong ratings in a family friendly time slot. However, the question remains, does the series deserve a second series? Five episodes in, and the results have been spotty at best. It's a spoon full of sugar that the news comes on a week when the show was at a high, as White Lies, by series creator Howard Overman, much like his previous A Boy of No Consequence, is a better episode for extending itself beyond the confines of the series mandate. Just as, and I hate constantly comparing this series to Merlin, but just as Merlin often felt the most weighted down when forcing elements of the Arthurian mythos into the series, so too does Atlantis. It's when Atlantis shrugs off the established Greek mythology, and plays with the characters and environment in it's own way, that the series shows the most potential. Hit the jump for the review, which contains spoilers that have been gambled for you. So, yet again, there is no traditional myth to dissect here. In fact, they created a new character out of whole cloth, in the form of Therus, sister to Ariadne and rightful heir to Atlantis (in fact, of Ariadne's many siblings, there wasn't one even nearly named Therus). In doing so, we were able to actually get to know Ariadne as more then just capable of a few forlorned glances or biting remarks. Which, episode five is a bit late to finally establish your series romantic lead as a character, but at least they got to it. It also filled in more of the history of the Minos family, and gave us more insight into Pasiphaë's game. So, the time line looks like this: at some point more than a decade ago, Pasiphaë manipulated herself into Minos' bed, expelling (or more likely killing) Minos' original wife, and mother to Therus and Ariadne. She then Lady Macbethed him into overthrowing the rightful king of Atlantis, and installed him as a puppet leader. Ten years ago, as he was "coming of age" and was about to be declared heir apparent, she implicated Therus in a plot to overthrow his father, forcing him to flee the city and live in hiding. Now, he has returned as Ariadne nears her "coming of age" so that he might protect her from their wicked step-mother. And I honestly don't know what Overman meant by "coming of age." First off, a daughter would never be heir to a kingdom. A previous episode already covered this material, in the Bronze age the right to the throne would pass to the daughter's husband, in this case Heptarian, her betrothed. Second, at that time, daughters were being married off as young as nine or ten to husbands, and Aiysha Hart is obviously older than that, so clearly that was a plot device that Overman hoped people wouldn't pass that much attention to. It also brings to the surface a potential new theory for Jason's parentage: Jason's father was the Atlantian king that Minos overthrew, who then escaped through the wormhole into the modern world. The poor fellow who was turned into the Minotaur would have been a loyal supporter of the previous King, and Jason's bull horn necklace would have been the royal symbol. Of course, it still doesn't answer the question of where his father is, or why he would have went back to Atlantis at all. But, despite the flagrant use of magic on the show, this theory is at least more in keeping with the complete absence of the Gods. The political manipulations kept this episode interesting enough to get us over the bits that sagged. Hercules' obsession with the beetle was funny, but went on too long. But at least the beetle was more interesting and contributed more to the plot than Pythagoras. Medusa put in little more than a cameo, and barely had one line of dialogue, and was sorely missed. And Alexander Siddig reminded us that he is an actor of some quality, turning in a performance that was closer to Earth than it was BRIAN BLESSED. As for the romantic chemistry between Jason and Ariadne, there simply isn't any. The whole rom-com messy apartment bit int he middle was a sore reminder of last week's Three Men incident, and a reminder that action without character is just pointless plot gerrymandering. Even worse was the whole "kidnapping his sister" plot that Therus had worked out, with a slow acting but fast to wear off sleeping potion, that apparently only incapacitates the drink during those moments they don't have to monologue. What did work was the political stuff, seeing the full scope of Pasiphaë's plan (though, I don't understand her end game. She is already Queen, there isn't much higher left for her to go) and the manipulations she has had to put in place to make it work. Therus seems like a solid character with potential to be an ally during his inevitable return (if the episode had a greatest weakness, it's that nothing much was actually achieved outside of introducing Therus as an element in the universe). And the writers continue to give all the best growth to Hercules, rather than Jason. It is the fat, drunken oaf who figures out that the servant's story is false, while Jason sits back and fawns over his destiny. That Hercules isn't as dumb as he seems, just lazy, is pretty much a given, and the more missions he goes on, the more he's beginning to like the hero game, and the sharper his focus is becoming. Jason only seems to be there to get Herclues into the situations he needs to be in, to prove himself. So long as he doesn't get distracted by a bug.